Rab Wallpack in bronze color, features precision die-cast aluminum housing with polyester powder coated finish. This wallpack uses 55-Watt LED lamp that has voltage rating of 120 - 277-Volts and current rating of 0.46-Amp at 120-Volts, 0.29-Amp at 208-Volts, 0.25-Amp at 240-Volts, 0.22-Amp at 277-Volts. Lamp of the wallpack has color temperature rating of 5000K and color rendering index of 81 to ensure optimal light level in the surrounding. 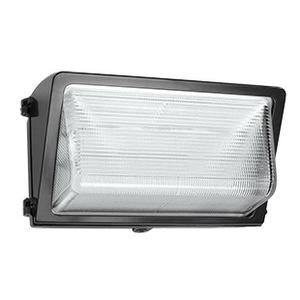 Lamp offers 6645-Lumens of bright light output. Wallpack features high-gloss white aluminum reflector for uniform distribution of the light. 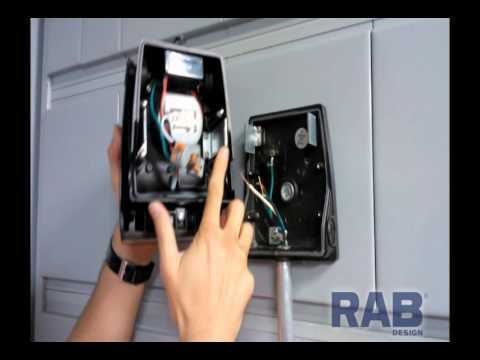 This junction box/direct wall mountable wallpack measures 9-Inch x 17-Inch x 10-Inch. It has average life of 100000 hours. It comes with borosilicate glass lens and high temperature silicone gaskets. This wallpack is ideal for wet locations. Wall pack is UL listed, DLC certified and RoHS compliant.